Clinical review: Anticoagulation for continuous renal replacement therapy - heparin or citrate? Heparin is the most commonly prescribed anticoagulant for continuous renal replacement therapy. There is, however, increasing evidence questioning its safety, particularly in the critically ill. Heparin mainly confers its anticoagulant effect by binding to antithrombin. Heparin binds to numerous other proteins and cells as well, however, compromising its efficacy and safety. Owing to antithrombin consumption and degradation, and to the binding of heparin to acute phase proteins, and to apoptotic and necrotic cells, critical illness confers heparin resistance. The nonspecific binding of heparin further leads to an unpredictable interference with inflammation pathways, microcirculation and phagocytotic clearance of dead cells, with possible deleterious consequences for patients with sepsis and systemic inflammation. Regional anticoagulation with citrate does not increase the patient's risk of bleeding. The benefits of citrate further include a longer or similar circuit life, and possibly better patient and kidney survival. This needs to be confirmed in larger randomized controlled multicenter trials. The use of citrate might be associated with less inflammation and has useful bio-energetic implications. Citrate can, however, with inadequate use cause metabolic derangements. Full advantages of citrate can only be realized if its risks are well controlled. These observations suggest a greater role for citrate. Heparin is the most commonly prescribed anticoagulant for use during continuous renal replacement therapy (CRRT) . By implication, it is considered the standard of care. There is, however, increasing evidence questioning the safety of heparin particularly in the critically ill, and there are accumulating data on a potential better alternative, regional anticoagulation with citrate. In the present review, we discuss some of the complex inter-actions between heparin and the coagulation and inflammation pathways, the associated consequences of such interactions in terms of efficacy and safety in the critically ill, and the availability of the promising alternative citrate. In the present manuscript we often refer to heparin, not discriminating between unfractionated heparin and low molecular weight heparin (LMWH). Clinicians should, however, be aware of their differences . LMWHs have a lower antithrombin (AT) dependency, cause less tissue plasminogen activator inhibitor depletion, exhibit less binding to proteins and cells, cause less activation of platelet factor 4 and cause less heparin-induced thrombo-cytopenia. Some of the effects mentioned below will therefore be less pronounced for LMWH. Many of these effects are, however, described for LMWH as well - in such cases, we have indicated this in the text or the tables. 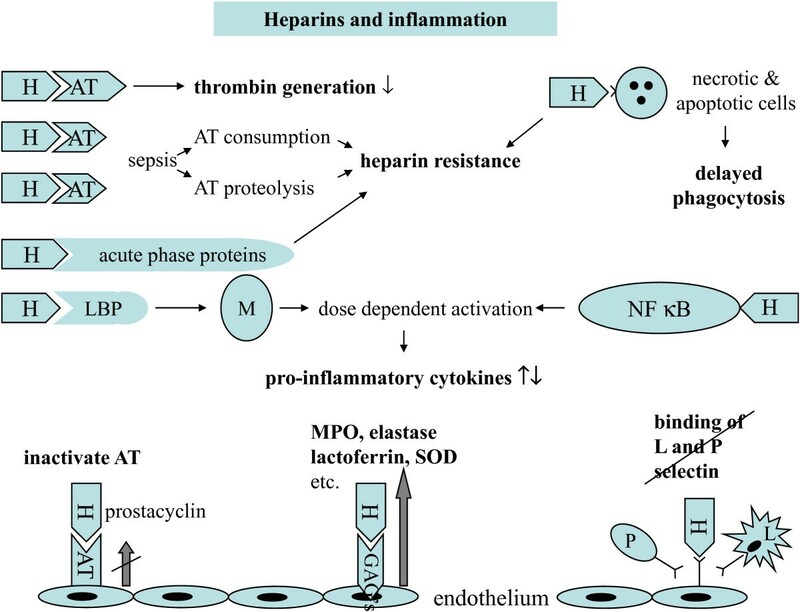 The anticoagulant effect of heparins depends on potentiating AT, the most important endogenous inhibitor of thrombin and other coagulation factors . In critically ill patients, however, AT concentrations are often reduced as a result of consumption due to activation of coagulation in conditions such as sepsis or systemic inflammation. AT is also reduced as a result of proteolytic degradation by granulocyte-derived elastase, and this effect is actually enhanced by heparin [3, 4]. During inflammation, elastase release is increased while its in-activation is decreased, because oxygen radicals decrease the activity of its natural inactivator α1-antitrypsin. Both high AT consumption and increased AT degradation thus contribute to heparin resistance during critical illness. Heparins not only bind to AT, but additionally to numerous other proteins and cells, thereby inducing unpredictable effects on many body functions. The binding of heparin to proteins other than AT limits the amount of heparin available to act as a cofactor for AT and thus decreases its anticoagulant effect . So-called heparin-binding proteins are released from endothelial stores . Among these are acute-phase reactants such as platelet factor 4, histidine-rich glycoprotein, vitronectin, fibronectin and lipopolysaccharide-binding protein, all of which increase in sepsis and other forms of inflammation [2, 7–9]. Furthermore, heparin avidly binds to apoptotic and necrotic cells to discrete domains released from the nucleus onto the membrane as the cell dies . Affinity of dead cells decreases if heparins with a lower molecular weight are used. Apoptosis is a key mechanism of cell injury in sepsis-related multiorgan failure, while necrotic cells are abundant in ischemia reperfusion injury. Importantly, the heparin-binding sites on apoptotic cells also signal phagocytotic clearance, and thus heparin may actually delay such clearance . A recent study in critically ill patients with acute kidney injury receiving CRRT with LMWH anticoagulation (nadroparin) found that early filter clotting was associated with severe organ failure, consumptive coagulopathy and heparin resistance. LMWH resistance was independent of low AT levels . In addition to low AT levels, increased heparin binding is therefore a feature of critical illness, also with the use of LMWH, and contributes to heparin resistance and possibly to other deleterious effects such as delayed phagocytotic removal of dead cells . The main drawback of heparin is that it causes systemic anticoagulation in addition to circuit anticoagulation. Heparin thus increases the patient's risk of bleeding. Critically ill patients are at risk of bleeding due to recent surgery, trauma, mucosal lesions and coagulopathy. More or less severe bleeding events are reported in 10 to 50% of cases, depending on the population and the degree of anti-coagulation [12, 13]. Using no anticoagulation treatment is a safe option with regard to bleeding, but not to clotting, because the circuit life is generally reduced. Circuit anti-coagulation without systemic anticoagulation (for example, regional anticoagulation) represents an ideal solution. Antagonizing heparin by administering protamine after the filter confers regional anticoagulation. The circulating heparin-protamine complexes, however, may be harmful . Regional anticoagulation with sodium citrate seems an attractive alternative. This topic is discussed below. Binding of heparin to AT not only potentiates its anti-coagulant effects, but additionally inhibits the anti-inflammatory actions of AT. The anti-inflammatory effects of AT are exerted through binding to glucosaminoglycans on endothelial membranes, enhancing the formation of prostacyclin. The binding of AT to glucosaminoglycans diminishes the adherence and migration of leukocytes, reduces platelet aggregation and decreases proinflammatory cytokine production [15, 16]. Heparin binding to AT abolishes this effect . Furthermore, during sepsis or ischemia reperfusion, elastase is increased. Recent data indicate that heparin, which normally potentiates AT, inactivates AT in the presence of elastase. This process leads to proinflammatory and procoagulant effects on the endothelium in sepsis, which may compromise the microcirculation and threaten tissue perfusion . Heparin may thus have adverse effects on the micro-circulation in sepsis [17, 18]. Both unfractionated heparin and LMWH can mobilize inflammatory mediators - such as myeloperoxidase, lactoferrin, elastase and platelet factor 4 - not only from circulating neutrophils and platelets and from cells adhered to and activated by the dialysis membrane, but also from glucosaminoglycans such as heparan sulfate on the endothelial surface [19–21]. Although this release may be interpreted as being protective for the endothelium, LMWH dialysis has been associated with higher serum concentrations of oxidized low-density lipoproteins compared with citrate dialysis, possibly indicating systemic oxidizing effects by myeloperoxidase . Mobilization of inflammatory mediators from endothelial glucosaminoglycans may be especially relevant in sepsis and other forms of inflammation. Heparin also releases the protective superoxide dismutase from the endothelium  and may have other anti-inflammatory properties as well . These anti-inflammatory properties may be partially mediated by inhibiting thrombin generation . In addition, heparin - at much higher doses than used for anticoagulation - seems to attenuate endothelial dysfunction after ischemia-reperfusion injury by blocking the inflammatory cascade at multiple levels, including complement activation , P-selectin and L-selectin-initiated cell adhesion and influx, and activation of the proinflammatory transcription factor NF-κB [26, 27]. In contrast to the observations in plasma-free conditions, where heparin seems to reduce endotoxininduced cytokine synthesis dose dependently  and to bind TNF [23, 28], both unfractionated heparin and LMWH cause a dose-dependent increase in IL-8 and IL-1β in plasma, which depends on the presence of lipopolysaccharide-binding protein . Heparin binds to lipopolysaccharide-binding protein, and this binding facilitates the transfer of lipopolysaccharide to the CD14 receptor, thereby augmenting the endotoxin-induced activation of monocytes [9, 18]. It should be noted that, for the prevention of clotting of the extracorporeal circuit, higher doses of heparins are often required, increasing the risk of proinflammatory effects [9, 29]. Altogether, translation of these experimental results to critically ill patients remains speculative. Post hoc analysis of the major sepsis trials in humans suggests that low-dose heparin might have favorable effects on survival . There is, however, probably a bias - the patients receiving heparin were less critically ill compared with those judged unable to tolerate heparin. Altogether, due to its avid binding properties, both unfractionated heparin and LMWH interfere at multiple levels with the inflammatory cascade (Figure 1). The effects depend on the dose, timing, the clinical setting and many unknown factors, leading to unpredictable effects. Simplification of heparin binding to proteins and cells. Heparins bind to proteins and cells, and thereby interfere with the inflammatory cascade and, altogether, confer unpredictable consequences for critically ill patients. H, heparin; AT, antithrombin; LBP, lipopolysaccharide-binding protein; M, monocyte; MPO, myeloperoxidase; SOD, superoxide dismutase; GAGs, glucosaminoglycans; P, platelet; L, leukocyte. A feared side effect of heparins is the development of heparin-induced thrombocytopenia, related to the binding of heparin to platelet factor 4 released from activated platelets. Some patients develop antibodies against this heparin-platelet factor 4 complex. The antibody-platelet factor 4-heparin complex subsequently binds to platelets, inducing platelet activation, aggregation and activation of the coagulation pathways. This sequence results in a loss of circulating platelets and a prothrombotic state . Depending on the dose and type of heparin, on the population and on the criteria used for diagnosis, <1 to 5% of heparin-treated patients develop heparin-induced thrombocytopenia [31–33]. Given the above concerns with heparin, why is regional citrate anticoagulation not the standard of care? For several reasons, physicians are reluctant to switch to citrate anticoagulation. These reasons include concerns that the use of citrate is complex, carries a high risk of metabolic derangement, might even be dangerous and is expensive. Citrate is both an anticoagulant and a buffer, and for this reason it can be difficult to use and understand. Sodium citrate, administered before the filter, chelates calcium. The associated regional hypocalcemia in the filter inhibits the generation of thrombin [34, 35]. Citrate is partially removed by filtration or dialysis , and the remaining amount is rapidly metabolized in the citric acid (Krebs) cycle - especially in the liver, muscle and renal cortex - while the chelated calcium is released and the lost calcium is replaced. Systemic coagulation is unaffected. For anticoagulation, the citrate dose is adjusted to blood flow to attain an ionized calcium concentration <0.4 mmol/l in the filter; the lower the calcium concentration, the higher the degree of anticoagulation. Some protocols use a fixed dose of citrate in relation to blood flow according to an algorithm, and target such doses at about 3 mmol citrate/l blood flow . Other protocols measure postfilter ionized calcium and adjust the citrate dose, which complicates the intervention but optimizes anticoagulation [13, 38]. An increased SID produces alkalosis, while the infusion of a zero-SID fluid decreases SID and causes acidosis. Citrate is a triprotic acid with pKa values of 3.13, 4.76 and 6.40. A sodium citrate solution thus has a SID of zero until the citrate is metabolized. In conditions where citrate metabolism is grossly impaired, therefore, even trisodium citrate can first cause some acidosis before it produces its alkalinizing effect. Because sodium citrate acts as buffer, the replacement fluids must be adjusted accordingly. A myriad of home-made systems are in use and, unfortunately, add to confusion among clinicians: for predilution or postdilution, for hemodialysis or hemofiltration, or for their combination. All these modalities use different fluids and different ways to attain metabolic stability. None of the systems has yet proven superiority. The pros and cons have been summarized in various reviews . Reported derangements include metabolic alkalosis and acidosis, hypernatremia and hyponatremia, and hypocalcemia. They are detected with proper monitoring and the local protocol should describe how to adjust flows under different conditions to prevent such problems. The incidence of metabolic complications depends on the amount of citrate administered, the design, rules and flexibility of the protocol, and its proper use. In the largest randomized controlled trial, metabolic control with citrate was better than with heparin . Citrate tolerance depends on the amount of citrate entering the body and the capacity to metabolize citrate. The amount of citrate needed for anticoagulation is lower when using continuous hemodialysis compared with hemofiltration, because dialysis can be performed at a lower blood flow and therefore requires a lower citrate dose. Citrate metabolism is diminished in case of liver failure and also of poor tissue perfusion [41, 42], because the Krebs cycle only operates under aerobic conditions. Citrate accumulates if its metabolism is insufficient. The citrate molecule is not toxic in itself, but citrate accumulation causes ionized hypocalcemia in the systemic circulation, which may decrease cardiac contractility, cause hypotension by decreasing vascular tone and contribute to systemic hypocoagulability. Monitoring of the patient's ionized calcium is therefore crucial. Ionized hypocalcemia is the most sensitive indicator of citrate accumulation, but it can also stem from other causes, including an insufficient replacement rate. Citrate accumulation, while decreasing ionized calcium, concomitantly increases the total calcium concentration, because the citrate- bound calcium increases and calcium is replaced. The total to ionized calcium ratio, therefore, is a useful test to detect citrate accumulation [43–45]. A rise in total to ionized calcium ratio above 2.25 should trigger consideration of probable citrate accumulation . Although citrate accumulation can also increase the anion gap, this variable is insensitive in critically ill patients. In the aforementioned randomized trial, citrate anticoagulation was better tolerated than heparin . Notably, accumulation of citrate can additionally lead to acid-base derangements. Metabolic alkalosis occurs if a high sodium citrate load (for example, protocol violation or accidentally rapid infusion) is delivered and when the citrate is appropriately metabolized, providing bicarbonate equivalents or, according to the Stewart concept, leaving unopposed sodium (see above) . Metabolic acidosis occurs if a large citrate dose is not metabolized; for example, in liver failure or poor peripheral perfusion. A high lactate level (for example, >5 mmol/l) in patients with liver failure before the start of citrate CRRT may act as a useful marker of greater risk for citrate accumulation. Septic patients with a high lactate level generally tolerate citrate remarkably well if circulation improves. Accumulation of citrate is easily detectable with standard monitoring: arterial blood gases, ionized and total calcium at 6-hour intervals. If citrate accumulation occurs together with metabolic acidosis and an increasing calcium ratio, the citrate dose should be decreased or discontinued, calcium replaced and the patient should receive bicarbonate replacement, preferably as part of the balanced replacement fluids . With proper monitoring, citrate accumulation causes no clinical symptoms. Apart from the potentially proinflammatory effects of heparin on the release of mediators from leukocytes and platelets (see above), it may be hypothesized that local hypocalcemia at a membrane level during anticoagulation with citrate might reduce inflammatory mediator release from cells adhered to the membrane [46, 47]. Activation of neutrophils and the release of mediators from intra-cellular granules are preceded by transient increases in cytosolic Ca2+ caused by the mobilization of Ca2+ from intracellular stores followed by the influx of Ca2+ into the cell through the plasma membrane channels. Cytosolic Ca2+ subsequently acts as an intracellular messenger [48–50]. It should be noted that the effects of citrate on complement activation, especially seen when using the old unsubstituted cuprophane membranes, are not uniform - some studies report no effect [51–53], others report a suppression of activation . Degranulation seems to be mediated by a different membrane receptor, not related to complement activation and neutropenia . Citrate (C6H5O7) is a source of energy, conferring 3 kcal/g (0.59 kcal/mmol) [55, 56]. One gram of citrate corresponds to about 5 mmol. Part of the citrate administered before the filter enters the patient's circulation. The amount depends on the citrate infusion dose, its concentration in the filter and the amount removed by filtration or dialysis. The latter can be estimated, because the sieving coefficient of citrate is close to 1.0. Effluent loss corresponds to effluent flow × citrate concentration in the filter. The citrate concentration in the filter can be estimated by dividing the administered amount by blood flow. Postdilution hemofiltration estimation is easiest - the amount lost by filtration equals the infusion rate × filtration fraction, and the amount entering the patient is equivalent to the infusion rate × (1 - filtration fraction). Assuming a blood flow of 200 ml/minute, a citrate infusion rate of 3 mmol/l blood flow (36 mmol/hour), a filtration fraction of 0.20, and a filter running 80% of the time, about 553 mmol citrate enter the patient's circulation per day, providing close to 333 kcal/day. The present calculation is an estimate, based on physiological principles. Actual measurements have been published in abstract form recently . Note that citrate, although being an energy source, does not need insulin to enter the cell. Citrate is an easy fuel for the mitochondria, and may replenish the Krebs cycle if intermediates are scarce. Substrate availability is a crucial regulator of the Krebs cycle. The cycle is a central pathway providing energy and maintaining the mitochondrial redox state. In sepsis, inhibition of pyruvate dehydrogenase limits pyruvate conversion to acetyl-coenzyme A, the main substrate of the cycle . Furthermore, Weinberg and colleagues have shown that citric acid cycle intermediates may protect proximal tubules against injury and may promote recovery from sustained mitochondrial energetic deficit. This deficit occurs after hypoxia and reperfusion and acts by lowering the cellular burden of non-esterified fatty acids that appear to account for much of the continuing mitochondrial dysfunction [59, 60]. The serum concentrations of citrate reached during CRRT with citrate as an anticoagulant (0.3 to 0.5 mmol/l)  are in the range expected to modify tubular cell metabolism (personal communication). The main risk of citrate anticoagulation consists of the uncontrolled systemic infusion of a hypertonic citrate solution causing acute and severe hypocalcemia, hypo-tension and possibly cardiac arrest. Treatment consists of immediate calcium infusion and discontinuation of citrate infusion. Although comparative studies are not available and expenses differ between modalities, estimated costs of citrate anticoagulation are not substantially higher than those associated with heparin anticoagulation. Instead of measuring the activated partial thromboplastin time for the control of heparin anticoagulation, systemic ionized calcium and once-daily measurement of total calcium is sufficient for the monitoring citrate accumulation, with more frequent measurement only in patients at risk of accumulation. Replacement fluids including intravenous calcium are slightly more expensive when citrate is used. If the costs of less bleeding and longer circuit life are calculated, costs with citrate are probably less or may in fact represent cost savings. The use of citrate offers many advantages to the patient, which can only be taken if the risks are well controlled. The incidence of metabolic complications largely depends on the design, rules and flexibility of the protocol, and its proper use. Safe introduction of citrate should start with the choice of a well-designed and flexible protocol with proven efficacy and adjusted to the local preferences of modality and dose, and availability of fluids and devices. Results of ionized calcium measurement should be available 24 hours a day. Implementation of the protocol includes the training of staff to create understanding and awareness of acid-base and calcium monitoring, and the correction of imbalance . Safety is further improved by the incorporation of a citrate module in the CRRT device, blocking persistent citrate infusion if the blood pump stops. Pop-ups in the patient data management system and computerized algorithms may add to patient safety. The primary goal of anticoagulation for CRRT is to extend circuit life. Indeed, a shorter circuit life may result in underdosing of CRRT. Several studies have compared circuit life and bleeding complications under citrate treatment with nonrandomized controls on heparin treatment (summarized in [13, 38]). Groups were often not comparable, because the patients receiving citrate generally had a higher bleeding risk. Nevertheless, bleeding complications were lower in patients receiving citrate [61, 62]. Circuit survival with citrate was usually longer, sometimes similar and, in some studies, shorter than with heparin (summarized in ). Five randomized controlled studies comparing anticoagulation with citrate to anticoagulation with heparin have been published [63–66] (Table 1). Three of these studies report a significantly longer circuit survival with citrate, four studies (a trend to) less bleeding, and two studies less red blood cell transfusion using citrate. CRRT, continuous renal replacement therapy; RCOT, randomized cross-over trial; RCT, randomized controlled trial; NS, not significant; RR, relative risk. aMedian (interquartile range). bNumber of red cell units per day of continuous venovenous hemofiltration. cComparing citrate with the low molecular weight heparin nadroparin. dThree-month survival on an intention-to-treat analysis. eThirty-day mortality, estimated from the Kaplan-Meier curve. Most randomized studies evaluating heparin anticoagulation for CRRT are too small for a robust evaluation of clinical outcome . A recent randomized study in 200 critically ill patients receiving CRRT for acute kidney injury, comparing anticoagulation with LMWH (nadroparin) to regional anticoagulation with citrate, unexpectedly showed a 15% absolute increase in 3-month survival using an intention-to-treat analysis  (Table 2). In addition to improved patient survival, kidney survival was also better with citrate. The difference was significant for all per-protocol patients and tended to significance for the surviving patients. Among the higher proportion of surviving patients, therefore, more patients were free from chronic dialysis in the citrate group. Of note, the benefit of citrate on survival could not be fully explained by less bleeding. Citrate appeared particularly beneficial in surgical patients, younger patients, patients with sepsis (compared with no sepsis) and in patients with a high degree of organ failure. In none of the subgroups did citrate perform worse than heparin. These findings suggest the need for a better understanding of citrate anticoagulation and its challenges. These findings, however, were not confirmed in a more recent multi-center randomized trial, including a slightly different patient population, using a different citrate protocol and reporting a shorter follow-up . UFH, unfractionated heparin; LMWH, low molecular weight heparin; LBP, lipopolysaccharide-binding protein. The use of heparin as an anticoagulant for CRRT is hampered by complex interactions between the drug and numerous acute phase proteins, and apoptotic and necrotic cells. In addition, heparin binding inhibits the anti-inflammatory effects of AT, which may already be low, and triggers the release of inflammatory mediators from blood and endothelial cells. This myriad of actions leads to an unpredictable dose-effect relationship and an uncontrollable and potentially deleterious interference with proinflammatory and anti-inflammatory pathways. In randomized clinical trials, heparins are often less effective for preserving circuit life while they increase the patient's risk of bleeding. The benefits of citrate include less bleeding, a longer or similar circuit life, and possibly better patient and kidney survival. The last benefit needs to be confirmed in larger randomized controlled multi-center trials. The use of citrate might be associated with less inflammation and has useful bio-energetic implications. These observations call into question the primacy of heparins for circuit anticoagulation in the critically ill patient and suggest a greater role for citrate (Table 2). The full advantage of citrate anticoagulation can only be realized, however, if its risks are well controlled by means of a sound protocol, well-trained staff, and the incorporation of a citrate module in the CRRT device.